Tear gas, stun grenades and knuckle-dusters provided a grim, bloody backdrop as hooliganism returned to haunt Europe's top leagues this weekend. 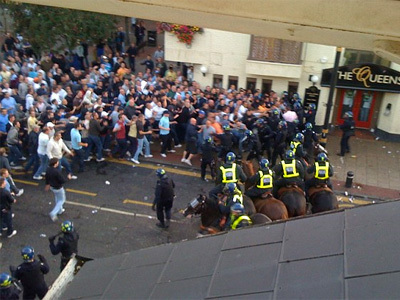 From London's showpiece Wembley Stadium to Munich's glittering Allianz Arena and at the 2004 Olympic Stadium in Athens, fans fought hit-and-run battles with riot police. Fourteen fans were arrested and four police officers were hurt after Millwall fans fought amongst themselves as their team went down to a 2-0 defeat to Wigan in the FA Cup semi-finals at Wembley. Police wielding batons eventually brought the disorder under control.